TOPIC: Whatcha Listening to Right Now? She Work hard for the money ,By the late Donna Summer , May she Rest in Peace . I destroyed the periodic table, because I only believe in the element of SURPRISE! Howl! I should probably get a signature. Saiyuki Gaiden OVA 5th preview music. very sad and pretty. Youtube it if you get the chance. I've been listening to it non-stop and it's slowly becoming an addiction. Not to mention the music video is super sparkly. Last Edit: 2012/07/10 01:50 By SakuraAngel1. 'Feet' by Rodney Atkins, and I think I need to write a story because of it. The dolphin demon who love Sesshomaru. I claimed Naraku's curly hair because he stole it from me years ago in the claim game. Sentry The Defiant by Coheed and Cambria. So glad Coheed and Cambria have more music coming out! 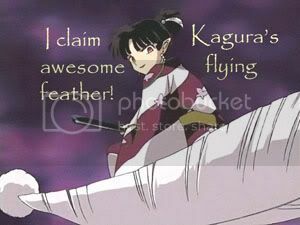 Lyss has claimed Kagomes Archery Skills in The Claim Game! "She is the one thing on Earth for which he still pines"
Last Edit: 2012/10/22 10:57 By phishbon3s. The Kills - "Future Starts Slow"